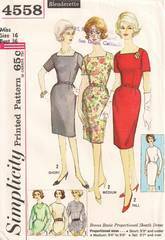 Mad Men ear Joan style dress with square or round neckline, slim skirt and back kick pleat. Short set-in sleeves and back zipper closing. Self or purchased belt. Proportioned for short, medium and tall.